Here are two lessons on recreational drugs. The first helps students understand the range of mechanisms by which different recreational drugs affect synaptic activity. There is a lesson plan, slideshow and an activity in which students must work out the effect of a different drugs on postsynaptic firing rates. The second lesson explores where our understanding of cannabinoids comes from and contains different activities to get students thinking about biopsychological research. There is a lesson plan, a slidehow and a reading on cannabis research. Edit: here is a link with more detail on the reciprocal teaching routine. Also, I forgot there was a Socrative quiz to go with this lesson. Here are some resources for a lesson on synaptic transmission. It’s based around this modelling activity for teaching synaptic transmission. There are some slides, a text on synaptic transmission, a Socrative quiz on the structure of synapses and a moderately tricky activity on summation and excitatory/inhibitory inputs. You will be clearing up ping-pong balls for days. Many students seem to come to us with a block about bio-psychology. I’m not sure why this is but I suspect it’s got something to do with the English science curriculum, whose writers have apparently mistaken content load in the absence of conceptual coherence for academic rigour. But that’s an argument for another day and, probably, a different blog. The issue is, faced with content-load problems of our own, and in the face of students’ objections to learning ‘all that science stuff’ it’s easy for us to retreat into a ‘here it is, you’ve just got to memorise it’ teaching style. And it is quite easy to teach things like synaptic transmission this way – all we have to do is drill the students with a series of steps, probably with accompanying diagrams. Provided, that is, we’re content to settle for teaching for knowledge, as opposed to teaching for understanding. Now, there are arguments for taking that approach: it’s quick, and if the assessment for which we’re preparing the students is recall based, it’s often good enough for the purpose of ‘getting the marks’ in an exam. However, if our values are oriented towards teaching as a way of changing students’ understanding of their world then it might strike you as unsatisfactory. And even if we’re not, recent changes to the A – Level psychology exams mean markedly increased demands on students’ capacity to think with content as opposed to just recalling it. There is strong justification, therefore, for teaching biopsychology in ways that move beyond the more presentation of information. Over the past few years I’ve made increasing use of physical models to teach biopsychology. They make biological processes concrete for the students, who may find it difficult to visualise events at the microscopic level, and they reduce working memory load because having manipulable objects at hand makes fewer demands than maintaining mental representations of multiple concepts, especially when these are newly acquired and not well integrated with long term memory (there is some debate about this, but see Pouw et al, 2014). Here’s an approach to teaching synaptic transmission that can be extended to a range of related areas including the mode of action of drugs and biological explanations of mental disorders. I’ve used it with groups of up to 20 or so students; more than that and it would probably be better to divide the group. You’re going to need lots of ping-pong balls. I bought a box of 500 from eBay for about a tenner. Prepare by inviting students to read about the process of synaptic transmission. This could be for a home learning task or in class using a reciprocal teaching routine. There’s a reading on synaptic transmission here that you can use or there are any number of web and textbook resources. Arrange your teaching space so there’s a large, clear floor area. Explain that we are going to deepen our understanding of synaptic transmission using the ping-pong balls. Tell the students that they should organise themselves to depict the process of synaptic transmission. 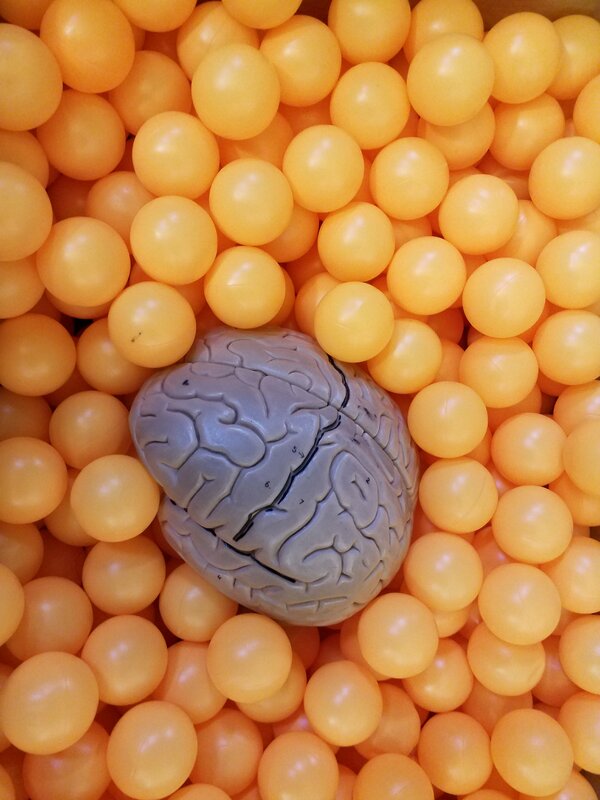 The only rule is that each ping-pong ball represents one molecule of neurotransmitter. At this point, let the students sort themselves out and observe what they do. It is likely that they will arrive at an arrangement whereby one set of students is passing the balls to another set (or possibly throwing or rolling them). Whatever they do, it represents their shared conception of synaptic transmission, so it’s your starting point for developing that understanding further. At this point, pause proceedings and ask named students to explain how the model represents synaptic transmission. ‘There are no more ping-pong balls left in the box and loads in the synaptic gap’, (can lead to the importance of neurotransmitter concentration, the reuptake mechanism and the possibility of neurotransmitter depletion). And so on. How far you take this depends on your inclination and the time available. I’ve found it’s usually possible to generate a model that includes the pre- and post-synaptic firing rate, vesicles, diffusion/concentration, receptors, enzymes that break down the neurotransmitter and the reuptake mechanism. It is crucial that you keep questioning named students about the correspondences between different elements of the model and the process of synaptic transmission. The model doesn’t teach anything on its own; it’s a point of focus for the dialogue between you and the students. A good way to finish the activity is with a free writing exercise in which students either describe the process of neural transmission from memory or write an explanation of how their model represents the process. This should be done from recall and allows them to consolidate understanding whilst giving you a chance of catching any remaining misconceptions. Once you have established a viable model, you can use it in a number of ways. Simply recreating the model on a future occasion is a good revision activity, especially if done from free recall and if students are instructed to take on different roles from last time, so they have to co-construct their understanding again. You can use it to develop further understanding e.g. ‘what you have modelled is an excitatory synapse – how would things be different in an inhibitory synapse?’ You can also use it as a basis for teaching related ideas e.g. the effects of drugs e.g. ‘What would happen if we stopped the reuptake mechanism from working/what would happen if we blocked off these receptors?’ etc. This approach is not without its risks. You may feel that you cannot rely on your students’ capacity to self-regulate during activities like this. That’s your call, but I would urge you to give it a go. You do need to be on the lookout for social loafing – some students may feel able to position themselves as an innocuous section of neural membrane and quietly opt out of proceedings. For this reason you need to keep up with the directed questions throughout. Finally, and most seriously, there is a possibility, when using vivid demonstrations, that what students will encode is that they did an unusual activity and it was fun but not the actual conceptual content of the demo (see Willingham, 2010). For this reason I regard the preparation reading as crucial and would never attempt to use the above approach to teach synaptic transmission ab initio. It is also critical to keep prompting the students to re-encode what they are doing in terms of the target concepts and understanding through questioning at the time and in the follow-up activity. Of course, I cannot prove that doing it this way will result in better understanding and learning than the approach it replaces but there is good reason to believe that it might. And it’s a lot more fun. Pouw, W.T.J.L., van Gog, T. & Paas, F. (2014). An embedded and embodied cognition review of instructional manipulatives. Educational Psychology Review, 26, 51-72. Willingham, D.T. (2010). Why don’t students like school? A cognitive scientist answers questions about how the mind works and what it means for the classroom. San Francisco: Jossey-Bass.